Standing as a tribute to its storied past, St. Augustine is this nation's oldest city — founded 42 years before the English colonized Jamestown and 55 years before the pilgrims landed at Plymouth Rock. St. Augustine is situated on Florida's First Coast where the old blends with the new — significant historical landmarks and newer attractions. What is St. Augustine's weather like? View St. Augustine's weather by month with average temperatures and rainfall. When Is Hurricane Season? The Atlantic hurricane season begins June 1 and ends November 30, with the highest storm probability from August through October. When planning your vacation to St. Augustine, how you're going to get there is an important consideration. These handy tools will help you decide whether it is cheaper to drive or fly. If you've decided to fly, you'll want to familiarize yourself with the airport and transportation options from Jacksonville International Airport, which offers the closest service. Daytona Beach International Airport to the south gives visitors another vacation combination option — visit the world's most famous beach and the oldest city in one vacation. St. Augustine is located in Northeast Florida along the state's Atlantic Coast and off of Florida's I-95. Once in St. Augustine it depends on where you stay whether your hotel offers transportation into the heart of the town's historical district. There are two different companies that offer tram or trolley tours of the city — Ripley's Red Train Trolley Tours and Old Town Trolley — both make multiple stops throughout the historic district and provide free parking. Castillo de San Marcos National Monument - One of the oldest structures still standing in North America — having survived over 350 years through bombardments, sieges and hurricanes — the structure has undergone changes, but appears much as it did when it was completed in 1756. Tours are self-guided, although rangers are on hand throughout the day. Historical demonstrations by re-enactors in period costumes are given periodically. Check schedule for presentation dates and times. Colonial Quarter - Journey through the centuries of St. Augustine's history, brought to life by re-enactors that immerse you in the sights, sounds and smells of three centuries. 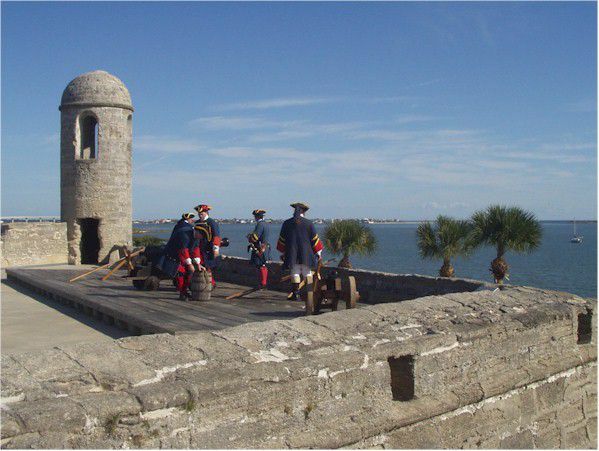 Also, climb to the top of a 17th Century watchtower replica for a birds-eye view of St. Augustine's bayfront. Fountain of Youth - Explore the very ground that Florida's first visitor discovered and take a drink from the fountain he is believed to have been seeking. Learn how the native Timucuas lived, hunted, ate and thrived for so long. Lightner Museum - Located in the Spanish Renaissance-styled Hotel Alcazar, explore America's Gilded Age through displays and artifacts. Potter's Wax Museum - The museum features more than 160 famous past and present movie stars, poets, composers, artists, authors, explorers, kings, and presidents. Ripley's Believe It or Not! Odditorium - Three floors filled with over 300 exhibits and artifacts like you've never seen before. St. Augustine Lighthouse and Museum - Climb the 219 steps to the top of the 165-foot tower, examine the artifacts in the maritime museum and explore the Victorian era house at the site of Florida's first lighthouse. Enjoy the magnificent view from the top and the audio self-guided tour. St. Augustine Pirate and Treasure Museum - Explore 300 years of high seas adventures and relive the golden age of piracy with authentic artifacts and real treasure collected by Pat Croce. World Golf Hall of Fame - Golf lives in Florida year round where history is uniquely chronicled and where legendary players are honored and exhibits pay homage to the tradition of a great game. Country Carriages - Tours of historic downtown St. Augustine by horse-drawn carriage or make any occasion special with a sunset carriage ride. Horseback riding also available. Ghost Tours of St. Augustine - Ghostly experiences include several tour options, including a unique journey into the darker side of St. Augustine's maritime history — ghost ships, pirate raids and nautical legends and tales from the high seas. Old Town Trolley Tours - Sightseeing made easy — hop-on, hop-off narrated tour of historic downtown St. Augustine. Ripley's Red Sightseeing Trains - Take a narrated tour of St. Augustine's historic downtown. Multiple stops make this a great way to get around the city. Ripley's Ghost Train Adventure or Haunted Castle Tour - You'll be on the edge of your seat as you conjure up ghosts amid the gravestones of historic St. Augustine. Nights of Lights - More than two million tiny white lights illuminate the entire downtown area during this annual celebration that runs from late November through the end of January. Its origin can be traced to the Spanish tradition of displaying a lighted white candle during the Christmas season. St. Augustine Lions Seafood Festival - Every March festival-goers enjoy fresh seafood, arts and crafts and live entertainment at Francis Field. Just minutes from the historic district of St. Augustine, lies the Atlantic Ocean and miles of beaches. Just follow highway A1A south over the Bridge of Lions onto Anastasia Island or a short drive north of the historic city to find beaches. Anastasia State Park - Enjoy four miles of beautiful white sand with ample facilities, including restrooms, parking, and picnic pavilions. Additional recreational opportunities include camping, bicycling, hiking, bird watching, kayaking, and canoeing. St. Augustine Beach - Situated in the heart of Anastasia Island, this stretch of beach includes St. Johns County Pier. Vilano Beach - Located north of historic downtown St. Augustine, the beach offers onsite picnic shelters and outside showers. Whether you plan to stay in a historic bed and breakfast with or without modern conveniences, a national branded motel or hotel or a luxury resort, St. Augustine is loaded with lodging options. A variety of over 30 St. Augustine bed and breakfast inns, including award-winning properties with historical significance, provide unique accommodations. Historic St. Augustine is fortunate enough to have a wide array of unique restaurants showcasing many cuisines, styles of dining and budget. Columbia Restaurant - If you've never dined at the Columbia, you're in for a real treat. Authentic Spanish cuisine is served in a beautifully decorated Spanish atmosphere that sets the stage for memorable lunches and romantic dinners. Whether you prefer fine dining or casual fare, these are your 10 Best Places to Eat in St. Augustine.